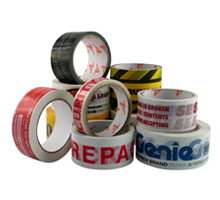 Custom printed packaging tapes offer great value, low cost advertising while securing your product. Spread your message, raise your company brand or profile, identify products, or offer handling advice with this popular promotional tool. Up to 5 colour printing available. White or clear background (flood coated background colours available upon request). Available in a wide variety of widths and lengths. Hand dispenser also available for easy application.